With the changing parameters of Google, picking an SEO-friendly theme for your website has become mandatory. Many bloggers ignore the importance of optimized themes in the beginning, but if you want your site to climb up the leader, this factor is something that you just can’t ignore. In this post, we have rounded up the 30 most popular SEO friendly WordPress themes available in the WordPress market. All the themes come with great flexibility in terms of customization. So if you are not happy with the look or feel, you have the liberty to customize them to fit your needs. Each one is very well documented and offers excellent support. So let’s check them out. Newspaper is an SEO Friendly WordPress theme that is designed for the blogger community. 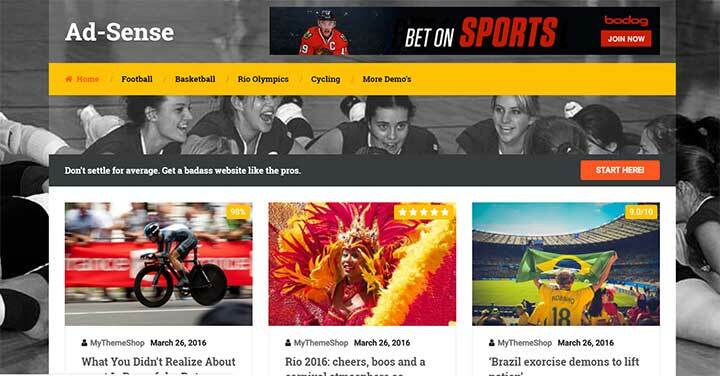 Apart from that, the theme can also be used to create, news, newspaper, magazine, publishing and review site. The theme also supports videos from YouTube & AMP. The theme is also compatible with the major social media platforms to allow content sharing. Newspaper comes header builder, a unique feature that allows you to make your header for every content. Page building is done by tagDiv builder which is again exclusive to NewsPaper. The landing pages can be customized; it is mobile friendly, fast, SEO ready, and comes with over ten author box layouts, GDPR compatibility packs a ton of premium free plugins such as AMP, currency exchange, weather, Instagram, social media, ad box, newsletter and so on. These features make this theme perfectly designed for fashion, lifestyle, cryptocurrency, food, modern, personal, travel, luxury, viral and other major and minor projects. Risen is an SEO Friendly WP theme which also has an elegant look and is very pleasing to the eye. It can be coined as the perfect theme with a flawless balance of design and performance. The theme is very responsive with a specific region for featured posts, nine pre-defined homepage sections, three predefined header layouts, speed, SEO & Ad-Sense Optimized, Schema integrated packs multiple language options, clean code, all Google fonts, unlimited colors & backgrounds. The editing is operated in a drag & drop builder to add your ideas. Risen also comes with a host of shortcodes, four different pagination options or scrolling options, WP review feature, sliding menu, import/export options, author box, lightbox, breadcrumbs, and ad-block detector are among the many features of Risen. The pricing of this theme is very pocket-friendly in which you also get a dedicated ad-management system, social sharing buttons, custom widgets, child theme support, one-click install & update, demo data with HD tutorials, very detailed documentation and round the clock support. Magnus is a self-learning theme that was formulated in a visionary manner and has been perfected in every manner to make your blog stand out. This SEO optimized WP theme is beautiful to look at. The theme is responsive to multiple screen sizes, has drag & drop editing options, three predefined header layouts, eight homepage sections, unlimited color, and backgrounds and four pagination options. Along with the looks, Magnus also has the skills with which you can build your website in a jiffy. It comes with an intensely flavored package of features. Some of the exciting features that Reactor packs are SEO, speed & Ad-Sense optimized along with integration to Schema, an advanced options panel, pristine coding, multi-language compatibility, Google fonts, off-canvas mobile menu, advanced typography, WP review compatibility, import/export options, dedicated performance options, single featured post option. Author box, lightbox, breadcrumbs, dedicated ad-management options, ad-block detector, six related posts layout, parallax effect, social sharing buttons, font awesome icons and child theme support. Divi is in very robust, fast & supremely intuitive drag & drop front end editor. The theme updates your customization instantly into the website thus cutting out any lag time for the changes to update. Divi is highly customizable and is exceptionally responsive to editing. It comes with a wide variety of content elements to unleash your creative ideas, import/export settings, over 20 premade layouts and non-existent loading time. 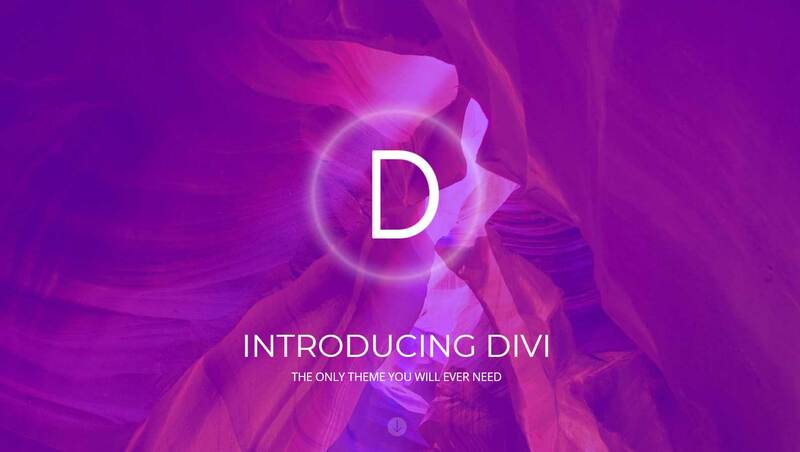 Divi’s exciting feature list comprises of an accordion, audio player, bar counter, blog,buttons, codes, comments section, contact form, email opt-in, filterable portfolio, gallery, image section, customizable user interface, draggable widths, instant content, portfolios, navigation, post slider, sidebar, post title, pricing table, social media sharing, sidebar, tabs, testimonial section, video and a lot more. All of the above, combined with an ever growing community to share information, a dedicated support system and moderation of client control access makes DIVI the ultimate tool for web designers. The pricing of DIVI is on the higher side, but with a one-time payment, you can get a license to build unlimited sites. Reactor is an impeccably beautiful theme to look at. The combination of colors and presentation is done in such a way that it makes users come back for more. The theme is very responsive to multiple screen sizes, has drag & drop editing options, predefined header layouts, ten homepage sections, unlimited color, and backgrounds. 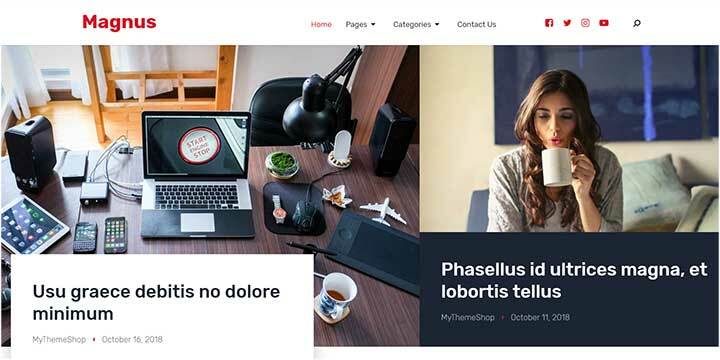 Apart from the looks, this SEO Friendly WordPress theme also has the skills with which you can build your website in no time. It comes with a very robust package of features. Some of the exciting features that Reactor packs are SEO, speed & Ad-Sense optimized along with integration to Schema, an advanced options panel, pristine coding, multi-language compatibility, Google fonts, advanced typography, WP review compatibility, import/export options, dedicated performance options, single featured post option. Author box, lightbox, breadcrumbs, dedicated ad-management options, ad-block detector, social sharing buttons, font awesome icons and child theme support. At a feasible price tag, Reactor comes with a somewhat healthy package of features which also includes 14 custom widgets, one-click install & update, HD video tutorials, extensive documentation & exclusive support. Ultra is a creation of the Themify team. The powerful and flexible nature of this SEO Friendly WordPress theme allows you to create any kind of website in no time. Ultra in its upgraded avatar comes with design skins and pre-made layouts. All of you do is press one click, and that imports the demo setup that includes theme setup, content, menus, widgets and a whole lot of other kinds of stuff. If you a developer armed with the Ultra theme, then building a website for an agency, restaurant, eCommerce, lawyer, wedding, fitness, spa, games, accountant, photography, education, music, lifestyle and more is just a few minutes away. This SEO Friendly WordPress theme now comes with a progress bar, countdown timer, contact form, WooCommerce compatibility, pricing table along with 60 pre-designed layouts, 17 header page styles, 5 single post layouts, 6 header background options and preset typography options, 15 preset colors, mega menu, archived layouts, animating colors, image filters, portfolio and a well of other features that you can put to good use on any website that you wish to design. Soledad is a multipurpose WordPress theme that can be used to design blog, magazine & newspaper websites. With its upgraded version, the theme is bigger, faster and a whole better. You get access to over 5000 demo pages upon purchase, and the installation is just one click process. You also get over a thousand slider, blog & magazine layouts to unleash your creativity. Apart from the above, Soledad gets three sidebar & 6 portfolio layouts. 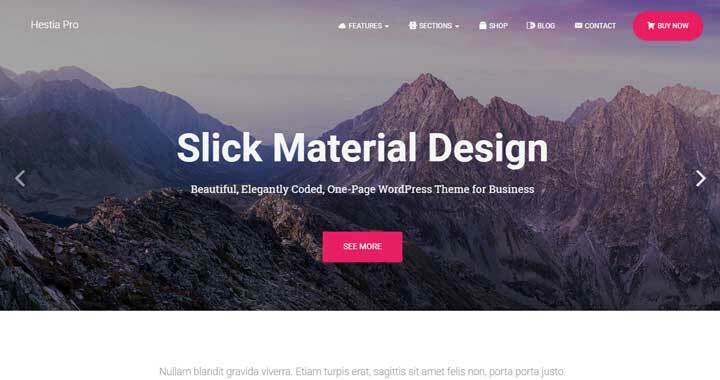 Has compatibility with BBPress & BuddyPress and also has 36 slider styles with some lovely features, WooCommerce compatible, comes with a Pinterest & Twitter widget, unlimited colors, get RTL support, multiple mega menu styles, featured video background, demo layouts, detailed documentation, dedicated and fast support for any issue you might face. Click Mag is the SEO Friendly WordPress theme that will amplify clicks and keep visitors flooding back to your site. 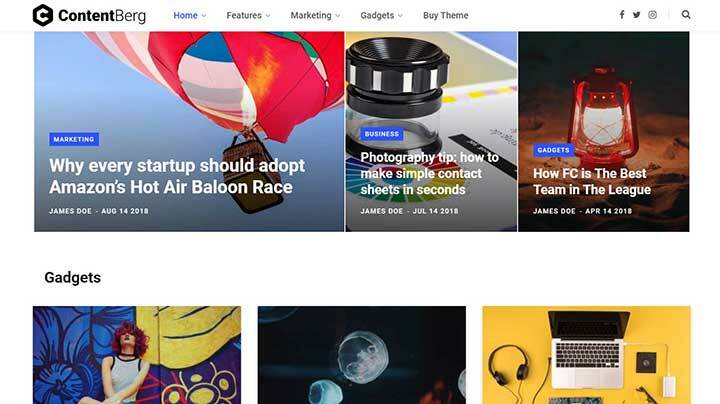 From its multiple social media sharing options, trending posts, ad exposure, SEO optimization, and an eye-catching design, Click Mag delivers the best user experience and clicks of any WordPress theme you’ve ever used. Some of the engrossing features that ClickMag has under its belt are one-click demo import which allows you to quickly set up the theme like the demo, video/audio posts with video compatibility with YouTube, Vimeo, and Soundcloud. ClickMag is also retina ready, loaded with Google Fonts, 800 of them, Click Mag makes optimum use of available ad space to give you a host of options to place your ads. It is RTL ready, comes with unlimited colors and seven custom widgets. Among other features are custom CSS support, full-width posts, mega menus, Facebook & Disqus comments support, BBPress and WooCommerce compatibility, and much more. Socially Viral is the ideal viral traffic booster while being fast and engaging at the same time. This SEO Friendly WP theme is designed and optimized to ensure your content move worldwide via social media platforms. The theme is integrated with the primary social media platform, along with Ad-Sense, thus paving roads for more money. There are four loading effects and a subscription feature in the theme which also ensures higher user engagement. The theme comes with unlimited background options, a rating system for posts, breadcrumbs options for top, featured and viral posts. Apart from being SEO optimized, you also get unlimited sidebars, colors & over 600 fonts, a library of shortcodes is at your disposal, multilingual translations, import/export feature, child theme feature, compatibility to WooCommerce, author box feature, extensive & exclusive documentation coupled with round the clock support. This SEO optimized WordPress theme is also completely multi-device responsive with ample customization option to test your creativity. All of the above features at clearly makes Socially Viral the best viral content booster the internet has to offer today. StudioPress is the perfect tool that you need if you desire to build jaw-dropping websites. Moreover, it is designed in such a manner that it can be used by a web developing agency as well as a freelancer by creating an account. Trust me when I say this, when you create an account and join the StudioPress community, you will experience a dynamic shift in your web developing world. We combine specialist knowledge in SEO, design, performance, security, support, and WordPress to help you build reliable, beautiful WordPress sites. The Genesis Framework and StudioPress are compatible with Gutenberg, the famous editor of WordPress themes. It’s been almost a decade that StudioPress has been offering world-class themes that excel in both design and infrastructure. The framework used by StudioPress, Genesis, shares the same fame as Gutenberg. This means developers are in awe after working with Genesis because it provides exactly what they need to build a secure, SEO-friendly, powerful WordPress site without the bloat. Figures such as 200,000 plus happy customers, 500,000 plus sites running on the Genesis Framework and a dedicated community of over 10,000 active members on its speak of the achievements accumulated by StudioPress and the accolades that they have garnered. Thrive Themes is a team which is extremely skilled when it comes to creating business-oriented themes and tools. In simple terms, it means that Thrive themes are good at building products that have the potential to convert a random visitor in your website to a potential customer. Products such as conversion based WordPress Themes, email list building tools, the thrive Architect, which is regarded as the fastest and the most intuitive editor for WordPress. 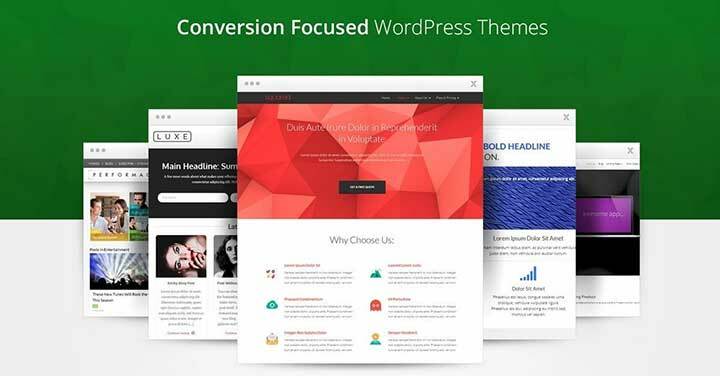 Thrive Themes is also a pro when it comes to create and publish landing pages for sales, webinar registration, opt-in pages and more. You also get a plethora of widgets that you can use across your website based on the post, pages, categories, tags etc. You can conduct A/B testing for your headers to analyze which will suit the most with the post or which will result in a high number of conversion from the viewers. Thrive themes also offers you scarcity marketing tools which come with widgets such as countdown timers and others to boost your conversion in a specific frame of time for a specific category. Thrive Ovation to create powerful testimonials which also has to potential to boost up the conversion. Thrive Quiz Builder which can engage users and viewers which will also help gain valuable insights are among the many features that Thrive Theme offers and can be deemed as an instrumental product range when it comes to boosting your business and expanding its outreach. 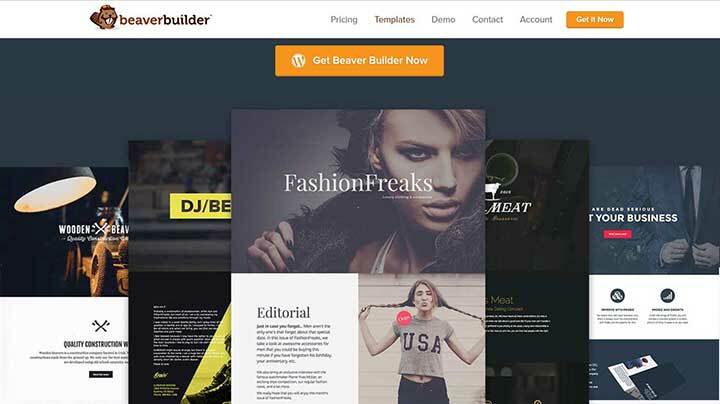 Beaver builder is a page builder that reduces your time and effort when it comes to making web pages. It is compatible with all the versions of WordPress and has the tag of creating close to 900,000 websites worldwide. Now that is not a small number, and if Beaver Builder has such a distinguished fan following, then it must be for a good reason (good features in this case). First, the most important aspect of Beaver Builder is that it comes with the license to unlimited sites. So, multiple payments for sites is worry that is gone with the wind. Beaver Builder some amazing templates which makes you save time on the designing aspect and yet allows you to add a dash of creativity on the template. Editing is undertaken via drag-n-drop mechanism thus resulting in pristine looking text & image combination. The child theme feature allows you to undertake your customizations. Choose from a wide range of styles and remodel them according to your taste. Schema is the swift loading, ultra-SEO friendly WordPress theme that has gained massive popularity since its launch. Featuring all the top features, including the custom options panel, all the shortcodes & widgets, and a pixel-perfect design, Schema also comes rich snippets to assist search engines in detecting your site and ranking you higher. This SEO Friendly WordPress theme is fully responsive and has an in-built review system, comes with HTML5 & CSS3 readiness. Schema comes with an integrated ad manager that makes tracking & controlling ads a cakewalk. The data import facility in Schema is absolute easy can move your data & settings with just click of a button. The options panel of Schema is power packed and allows you to perform a host customizations with a click of a finger. The snippets of Schema are very rich which supports Google to pinpoint your content and rank your content higher. The theme comes with unlimited backgrounds, complete set of Google fonts, supports multiple languages, custom widgets, demo data, integrated social media icons. The theme is very affordably priced and packs a lot of features. Zelle Pro is a single layout theme with an extremely flexible interface. The theme is WooCommerce ready, the live customization feature is a treat for the developers and Zelle is compatible with all the major page builder plugins. Some of the features that make Zelle a major player in the market is its SEO ready structure, translation and RTL integration, custom background and fast performance, mega menus and video tutorials. You also get demo content which will help you set up the theme in close to a minute, direct access to updates and constant support for the Zelle team. Zelle Pro also offers a host of other features in the paid format. So be sure to check their page to grab some exciting deal on the Zelle Pro theme package. 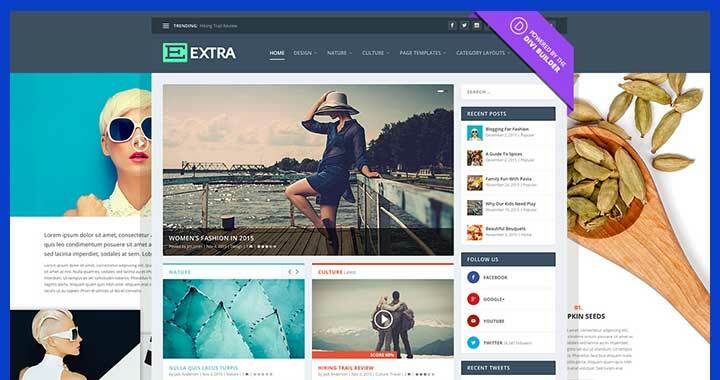 Extra is a magazine WordPress theme powered by the Divi Builder. With its drag & drop interface, building pages and then segregating it to categories is child’s play. Extra is fully responsive to all screen sizes & is also compatible with Woocommerce. Some of the EXTRAordinary category modules under its belt are posted feed, post sliders, advertisements, codes, and blog. This SEO Friendly WP theme is completely customizable based on the type of the post you want to publish, comes with multiple layouts, navigation, scrolling, header & footer options, shop, video slider, testimonial, countdown timer, contact form, blog and more. Extra packs seven different post formats allowing you to create a wide range of posts to catch the various tastes of your users. You can create story arcs for every post and generate rating & reviews for the posts. The Extra layouts can be implemented on any kind of posts. Extra also packs compatibility with social media tools for post sharing, pricing and number tables, gallery, slider, maps, portfolio and much more. The theme priced to suit the budget that you have and Extra guarantees that you will not be underwhelmed by the quality of results Extra delivers. Ad-sense is the foremost WordPress theme in the ad management sector that you can find on the internet. This SEO Friendly theme is exceptionally user-friendly & packs some impressive features to assist you in making money from your website. Ad-Sense features include flexibility regarding ad placement areas in websites, eight predefined layouts for food, sports, apparel, fitness, fashion, travel, blog, etc. The theme comes with a fully responsive layout, inbuilt ad-blocker detector, popup for ad blocker, hide content feature in the presence of an ad blocker, supports Google Ads, ad display option before/after posts, multiple homepage options. Moreover, Ad-Sense is also optimized for SEO, speed, performance & translations, has an integrated review system, unlimited color & google fonts, typography options, CSS addition & AJAX search features. Added to that, the ads can be shared in social media, has the author box feature, has an improved import/export option, child theme feature along with elaborate documentation. 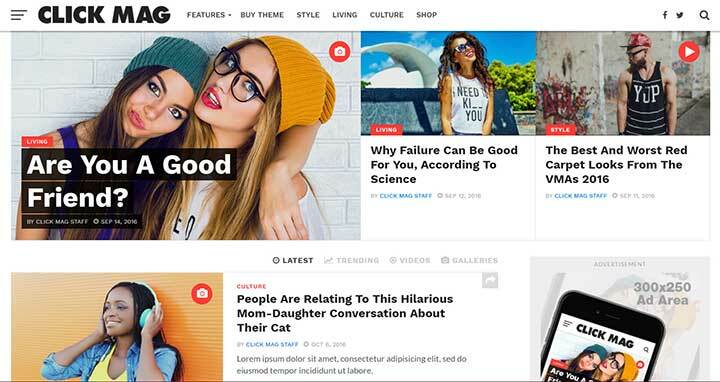 ContentBerg is a complete package for bloggers, writers, and serious content marketers. While the design may look minimal, it’s enormously feature-rich. With full Gutenberg compatibility, you can now embrace the future of WordPress with Contentberg. The theme is Google AMP supported, gives fast loading, WooCommerce compatible, article sharing on social media, multi-page layout, elegant and unique features, custom widgets, multiple post formats, sticky top bar & navigation, off-canvas mobile menu, live customizer options, Yoast plugin compatible, mobile-specific logos, MailChimp subscription box, compatibility to Contact form 7, ‘like’ feature posts, 10 header layout, multiple footer layouts, home post carousel. There are more features to ContentBerg and once checking them out you will never have to search for another Blog theme ever again. 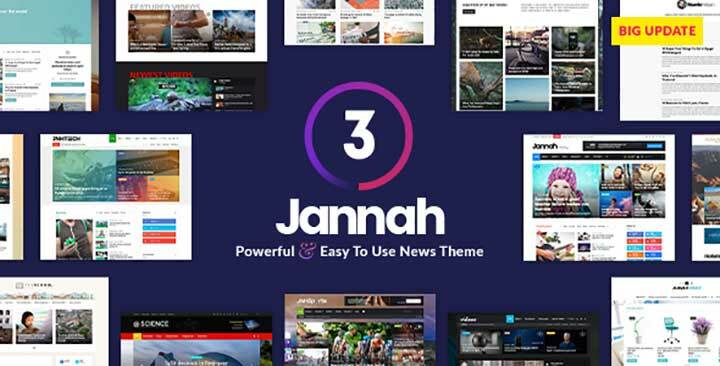 Jannah News is a newspaper & magazine theme that takes content marketing to a whole new level. With the latest upgrade, Jannah News packs three new themes for news, six more languages in its translation kitty. The theme is GDPR compliant and now comes with two new demo themes, new block style, added option for mobile usage, two new sliders, and ad sections. Movement of data across themes gets a lot easier with Jannah with its migration feature, custom mobile specific navigation & notification feature. Jannah is also compatible with AMP allowing faster loading pages, particularly when used in mobiles. 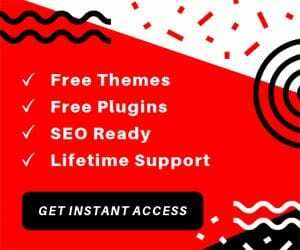 This SEO Friendly WordPress theme is also SEO, speed & performance optimized, integrated with BBPress, GIF support, web-based push notifications, close to 1000 font options, 20 pre-made demo styles, unlimited header options, more than 45 background patterns. Corporate is professionally targeted multi-purpose theme which is based on Themify’s website. The theme is perfect for businesses, portfolios, photographers and even general company websites. 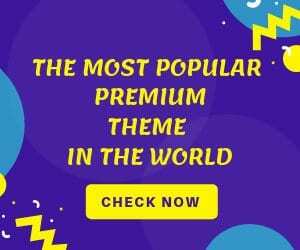 This SEO Friendly WordPress theme comes with some exclusive features such as video background, animations, social icons, animated progress bar, etc. Since layout creating is in your hands, with Corporate, you can create as many layouts as you want just by doing the drag and drop movement. You also get the demo content when you purchase the theme thus making your work a lot easier. Corporate is also WooCommerce ready and comes with the portfolio post type. A customizable header, testimonial, and team post type are among the sea of other features that you get with Corporate, thus making corporate the ideal WordPress theme for anyone. 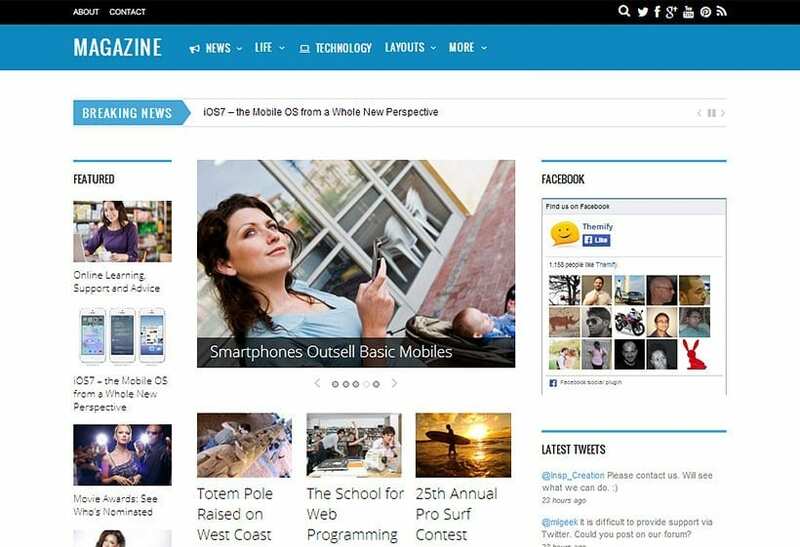 Magazine is a 3 column editorial theme which can be used to build a news and information-rich website. This SEO Friendly theme is responsive & retina ready and offers unlimited layouts, mobile slide navigation, area for banner ads, an icon for breaking news, social media sharing buttons, mega menu & footer menu options. Magazine also comes with six sidebar & 7 post layouts options, over 360 font awesome icons, a related posts section, six different color schemes and a styling panel that allows you to customize the theme to your taste. Magazine uses the Themify Builder for its editing which is in the drag & drop manner. It is SEO optimized and is translation ready and also comes with a child theme and multi-site support. Among other features you also get mobile slide menu, mega menu options, multiple ad display options, breaking news ticker, footer menu & widgets You will also get the demo theme, auto updates, logo image and WPML compatibility upon your purchase. 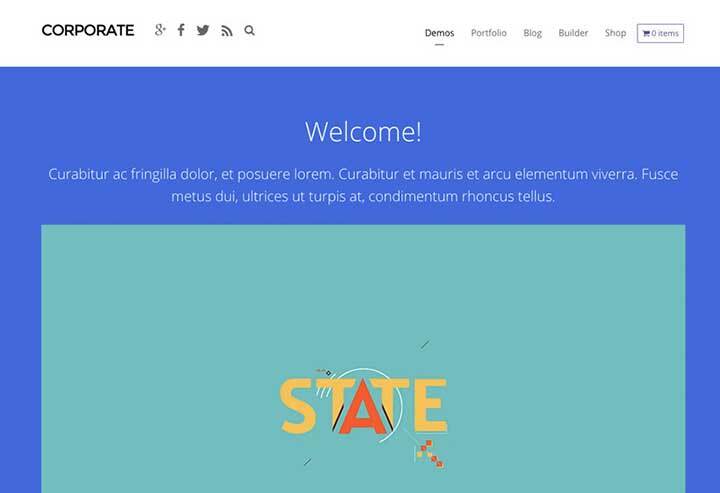 A design theme for businesses, startups, arts, e-commerce, portfolio and more. This alluring one-page layout, completed by the parallax scrolling and elegant sections, will make your content stand out easily. Hestia Pro is WooCommerce ready; the live customization feature is a treat for the developers and itis compatible with all the major page builder plugins. Some of the features that make Zelle a major player in the market is its SEO ready structure, translation and RTL integration, custom background and fast performance, mega menus, flexible interface, and video tutorials. You also get demo content which will help you set up the theme in close to a minute, direct access to updates and constant support. The support team on its own is very efficient and will most likely resolve your request or complaint within 24 hours. Hestia Pro also offers a host of other features in the paid format. So be sure to check their page to grab some exciting deal on the Hestia Pro theme. Newsmag is an extremely modern SEO Optimized WordPress theme for blog, news, magazine related website. Among the features that can be expected from such a theme, Newsmag also supports videos from YouTube. Thus not restricting your content medium to only text & images. Newsmag also has a rating system and is compatible with Google Ads and Ad-Sense. Among the many interesting & useful features of Newsmag are SEO readiness, blog index, post stats, breadcrumbs, subcategories & description & error templates. The theme also gets live search powered by AJAX, over ten demo themes and the editing of the theme is taken care by tagDiv Composer. 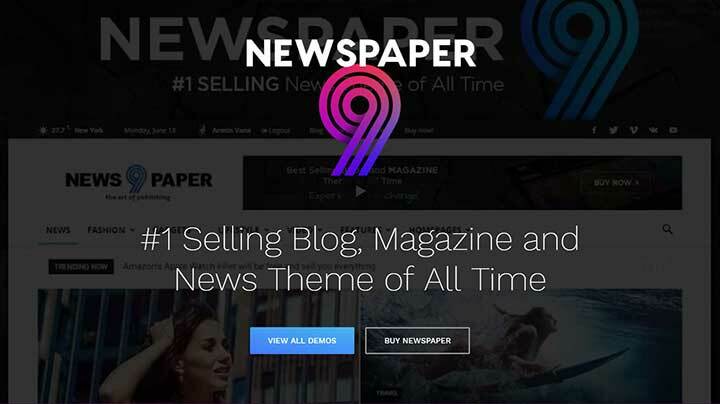 Newsmag is optimized for mobile, thumb downloader for YouTube, Vimeo & DailyMotion, inbuilt language translation support, GIF support, nine post styles, eight smart list templates, 4 top bar templates, ten styles for header & footer each, 16 predefined ad spots. The latest update received by NewsMag comes with more upgraded benchmarking design, versatile layouts, a lifetime of supports and an ever-increasing customer base. BoomBox is viral magazine theme with a superior design and an extremely versatile customizable layout. The theme offers a lot of gripping features and widgets designed to catapult your content at the peak of the viral network. The theme is particularly for those who wish to make money from their website. BoomBox offers you 16 demo themes to start with, front end post submission feature, two-layer header layout behaviour variations, boxed or full-width layout, responsive and mobile friendly layout, free lifetime updates, three premium plugins, post ranking & effective voting system and SEO optimized websites. The editing within the theme is taken care by the trust Gutenberg, comes with the Zombify plugin to facilitate front end support, unlimited headers, password strength meter, 4 post ranking types views, upvotes, comments and shared, 6 single post templates, sponsor articles, breadcrumbs, SoundCloud integration, 10 listing types, 13 features post area types, 5 slider bar options, BBPress and visual composer support. BeTheme is more than just a WordPress theme. Such an advanced options panel and Drag & Drop builder tool result in unlimited possibilities. 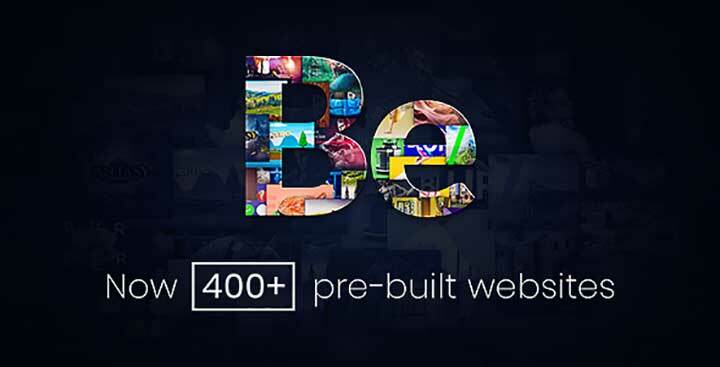 BeTheme is full of various pre-built websites so you can easily import any demo website in a blink of an eye. Till date, Be Theme has created websites successfully for electric, veterinarian, loan agency, charity agency, sitter, moving company, barber, health magazine, book writer, plumber, art agency, interior design company, webmaster, application, SEO agency, university, event company, developer, car rental, band, gym, designer, marketing agency, hosting company, travel agency, real estate company, photographer, renovator, small business company, hotel, mechanic, lawyer, school, shop and many more industries and individuals. Over 300 vector icons included 200 plus shortcodes, Spot.IM chat plugin, 600 plus Google Fonts included, SEO ready, contact page, about us page, careers page, our team page, press page, pricing page, unlimited sidebars for pages, 6 built-in custom widgets, revolution slider widget, custom logo, retina logo & favicon support, Google maps support, grid-based layout, Custom footer menu, built-in breadcrumbs, cross-browser compatible, full documentation included, HD narrated videos, 18 PSD files with UI Kit included, XML file with demo content, unparalleled support for customers. 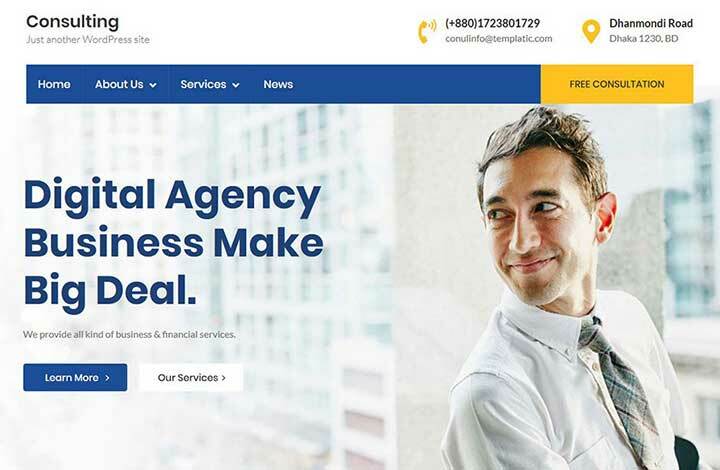 SEO WP is a flexible WordPress theme categorically designed for Digital Marketing Agencies, SEO company, Social Media freelancers and their clients. SEO WP is filled with content modules and custom pages which are designed to promote your content and highlight your social media marketing services. This SEO Friendly WordPress theme is fast, fully responsive with clean codes and super easy customization options. You also get ten premium plugin for free with SEO WP. Social share Icons, Google position tracker, master slider 3, mobile device icons, MailChimp opt-ins, PayPal elements, Google Maps, Menu Pro, WP menu Management, Mega Main Menu are the ten free widgets which otherwise would cost up to $185. You also get the SEO WP images with the demo theme, modern SEO service icons. The SEO Optimized WP theme allows you to present statistical data to your clients with regards to the performance of their website in Google, industry, and category-based case studies, e-book landing pages, and newsletter subscription options. This theme looks to be the perfect tool for any business or industry who wishes to climb the ladder of progress in the digital world, without a wrong step. 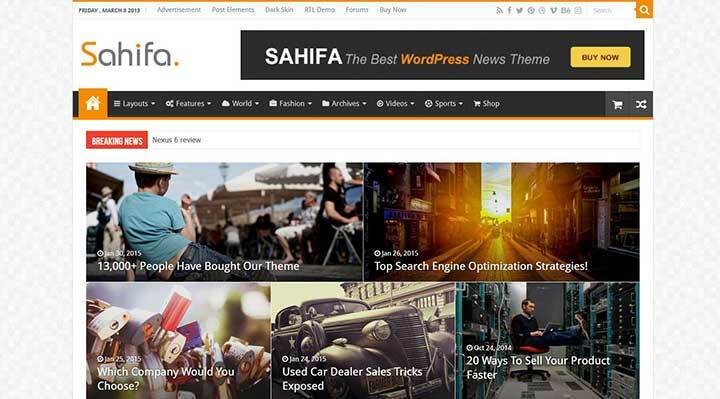 Sahifa News Theme is an exquisite, contemporary, user-friendly, fast-loading, customizable, agile, functional and fully responsive WordPress News, Magazine, Newspaper, & blog Theme. Sahifa is retina ready and has a powerful admin panel, supports multi-language translation. 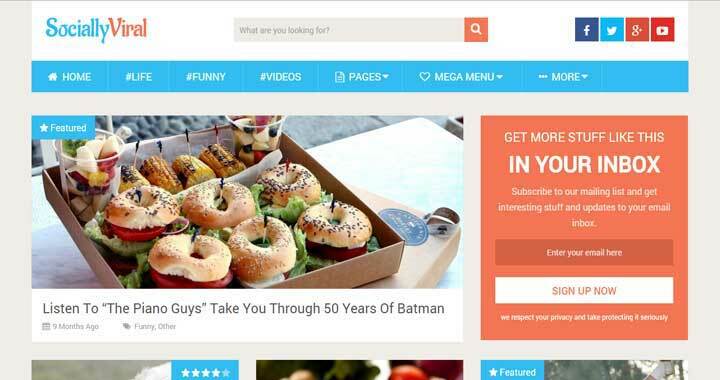 The theme is integrated with BBPress and BuddyPress & packs a host of block layouts. The demo theme can be imported with just one click, and you get a pack of social counter widgets for content sharing, theme layouts, mega menus & icons, slideshow feature for content, dark-skinned layouts, homepage sliders, off-canvas mobile navigation, AJAX live search, Instagram widget, weather widget, grid slider, 35 custom widget. Unlimited, sidebars & colors, over 650 Google webs fonts, micro-data review snippet powered by schema & SEO, multipage post support, customized categories, posts, pages & backgrounds, sticky navigation and sidebars, infinite scroll plugin and a whole lot of shortcodes, RTL language, and Ad-Sense support. The7 is regarded as the most customizable WordPress theme in the market. It features full and seamless integration with WPBakery Page Builder and Ultimate Add-ons. Its 1000 plus Theme Options allows crafting almost any design that the human brain can come up with. The Design Wizard feature lets you create a boutique-grade website design before the dishwasher finished the job. The7 comes bundled with Slider Revolution, Layer Slider, Go Pricing Tables and ConvertPlus. It is also fully compatible with most popular plugins like WooCommerce, WPML, Yoast SEO, All in One WP Migration, W3 Total Cache and many others. The7 has 40 (and counting) high-quality pre-made websites that you can use as a foundation for the website you are building. They can be imported in a single click. The7 will take care of installing all required plugin, content and sliders automatically. As an additional bonus, you get the access to an ever-growing library of premium Revolution Sliders and Visual Composer templates. Among other features, we have over 1000 Theme Options. With The7 you have the power to customize even tiniest details of your website appearance. Twenty-five versatile designs out of the box. You can use them “as it is” or as a firm foundation for your unique design. Options of customization with The7 is endless, and I would recommend that you go through every one of them, analyse their value and possibilities, and I am very sure you will not have to search for a theme ever again. Uncode is an extremely innovative multi-purpose WordPress Theme based on WPBakery Page Builder. It is clean and modern for any business sector: agency, freelance, designer, web designer, developers, marketing, startup, blog, magazine, portfolio, photography, architect, corporate, business, event, artist, music, restaurant, e-commerce shop, etc. Uncode comes bundled with a curated version of the drag-n-drop WPBakery Page Builder (Visual Composer) page builder, Revolution Slider, Layer Slider headers and iLightbox. With over 50 pre-made concepts ready to build anything you can think of building. 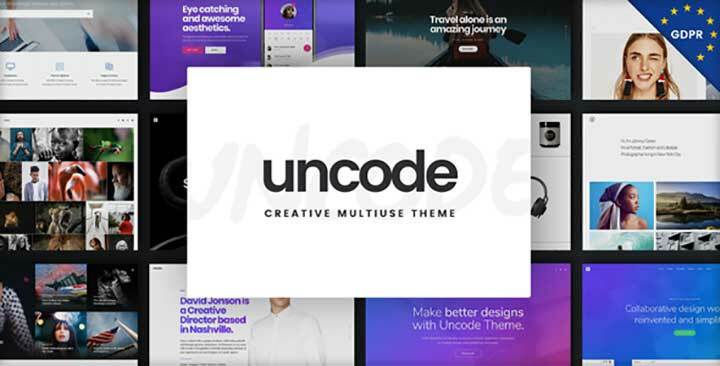 Uncode also offers you over 16 portfolio layouts, Google maps integrated, 8 menu types, typography options, integrated contact form 7, video support from YouTube and Vimeo, menu types, GDPR & RTL support, privacy plugin, WooCommerce integration, SEO readiness, CSS3 animations, infinite fonts options, social share feature and a trolley full of features. All these features & functions make the Admin panel of Uncode very diverse and cutting edge. Check out the complete details of Uncode, and I assure you that the assets and capabilities of this theme will make you spellbound. Consulting WP is by far the SEO Friendly WordPress theme. You get to choose from unlimited modern, clean and professional color skins, unlimited header layouts, to perfectly frame your content and suit your brand style. This business WordPress theme also comes with the Revolution Slider, so that you can create spellbinding slides with animated effects in no time. The Visual Composer drag and drop page builder is fast and intuitive to use, ensuring that page building and arrangement is a walk in the park for you, and the Theme Options panel in WordPress Customizer lets you edit your content in real time. It means that you can play around with the look and feel of your site with an instant preview before your changes go live. Consulting WP comes with 30 custom demos, GDPR plugin, real-time market stocks and forex module, 10 language files, 2 case study templates, 2 blog, news and team page templates, multi-location feature in Google Maps, 800 Google fonts, WooCommerce compatibility, WPML localisation support, one click demo installation, audio & video posts along with round the clock support and a very detailed and exclusive documentation. 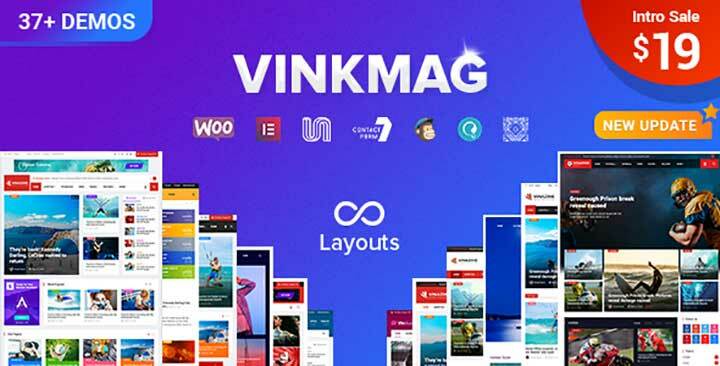 Vinkmag is a unique, news, magazine & blog WordPress Theme created for news agencies, tourism websites, a business magazine, Food blogs, crypto news, health and wellness magazine, technology sites and all type of publishing or review site. Vinkmag received an update less than a week ago, now supports RTL, That means you can now use our theme for RTL Arabic, Hebrew, Kurdish, Urdu, Persian, and Syriac languages. It also packs twitter bootstrap 4, SASS, slick slide, owl carousel, video popup, gallery and more. Vinkmag is a perfect All-in-One WordPress Theme for a better experience. It has over 16 homepage variations, more than ten header layout, multi-page design, kirki customizer, Unyson framework, fully responsive layout, font-awesome icons, Google web fonts. There are more features to VinkMag, and you will have to take a closer look to understand the capabilities of what this theme can do. Any Other SEO Optimized WordPress Themes? We have included only those themes in this list, that has gained popularity because of its performance and looks. We are sure you will love the collection. Have you used any of the above-listed themes before? If yes let us know your experience through your comments below. We would love to hear from you. With the changing parameters of Google, picking an SEO-friendly theme for your website has become mandatory. Many bloggers ignore the importance of optimized themes in the beginning, but if you want your site to climb up the leader, this factor is something that you just can’t ignore. Divi is in very robust, fast & supremely intuitive drag & drop front end editor. The theme updates your customization instantly into the website thus cutting out any lag time for the changes to update. Divi is highly customizable and is extremely responsive to editing. It comes with a wide variety of content elements to unleash your creative ideas, import/export settings, over 20 premade layouts and non-existent loading time. Apart from the looks, this SEO Friendly WordPress theme also has the skills with which you can build your website in no time. It comes with a very robust package of features. 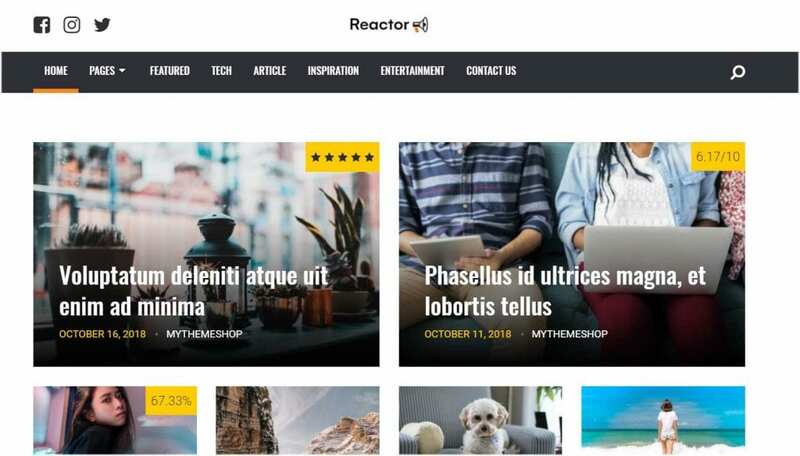 Some of the exciting features that Reactor packs are SEO, speed & Ad-Sense optimized along with integration to Schema, an advanced options panel, pristine coding, multi-language compatibility, Google fonts, advanced typography, WP review compatibility, import/export options, dedicated performance options, single featured post option. Author box, lightbox, breadcrumbs, specialized ad-management options, ad-block detector, social sharing buttons, font awesome icons and child theme support. Click Mag is the SEO Friendly WordPress theme that will amplify clicks and keep visitors flooding back to your site. From its multiple social media sharing options, trending posts, ad exposure, SEO optimization, and an eye catchy design, Click Mag delivers the best user experience and clicks of any WordPress theme you’ve ever used. 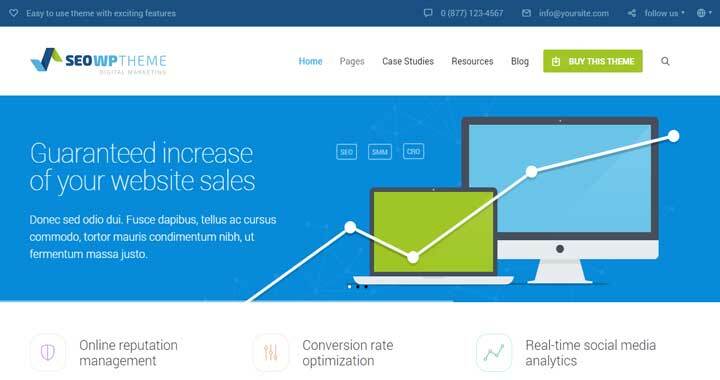 The SEO Optimzed WP theme allows you to present statistical data to your clients with regards to the performance of their website in Google, industry, and category-based case studies, e-book landing pages, and newsletter subscription options. This theme looks to be the perfect tool for any business or industry who wishes to climb the ladder of progress in the digital world, without a wrong step. We have included only those themes in this list, that has gained popularity because of its performance and looks. We are sure you will love the collection. Have you used any of the above-listed themes before? If yes let us know your experience through your comments below. We would love to hear from you.